Children with disability in Peru face significant challenges accessing education and health care. This is particularly evident in the informal settlements of Lima where children with disability face a myriad of physical and social barriers when it comes to accessing effective and affordable health services. Mary MacKillop Today works with families to raise awareness about the rights of people with disability, while providing access to allied health services including physiotherapy and speech therapy to children with disability in poor and underserviced communities on the outskirts of Lima. To ensure people with disability are supported and nurtured in the home, we conduct parent education workshops for the parents of children with disability on various topics including home therapy, self-esteem and confidence, nutrition and childhood health. Children and adults with disability have access to allied health services such as language therapy, physiotherapy and life skills workshops. Parents of children with disability attend bi-monthly workshops to build their skills and knowledge as carers, while developing a much needed support network. Up to 100 children with disability have increased access to vital health services. 135 parents develop new knowledge and skills through one-to-one consultations or bi-monthly workshops, building their capacity to create supportive and safe home environments for children with disability. Rosalia is a mother of three living in Jicamarca, a settlement on the outskirts of Lima. 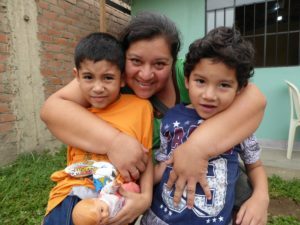 Rosalia’s youngest two boys both have autism, a condition that is widely misunderstood in many parts of Peru. For the past year, Rosalia’s boys have been accessing health services such as physiotherapy, language therapy and life skills workshops through the Community Health Project.